Currently, the BD590 shares the LG Blu-ray player king of the hill title with the BX580. Both have the top line features that you would expect in 2010 models including built-in Wi-Fi connectivity and a host of Internet content providers. The BX580 is 3D capable while the BD590 is not. But the 590 supplies one feature that sets it apart from all the other Blu-ray players that I have reviewed. The LG designers have integrated a 250GB hard drive into the chassis. Why, you might inquire, would I want a hard drive in my Blu-ray player? You need to think of the BD590 as more than a simple spinner of DVDs. By storing photos and music on the hard drive, the unit becomes a very viable stand-alone media server. 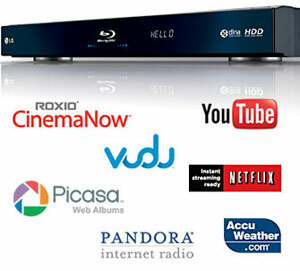 Blu-ray disc players were introduced in 2006. Since then, their specifications have evolved through three classifications, (Profile 1.0, 1.1 and 2.0). Profile 1.0 provided playback and basic interactive features. 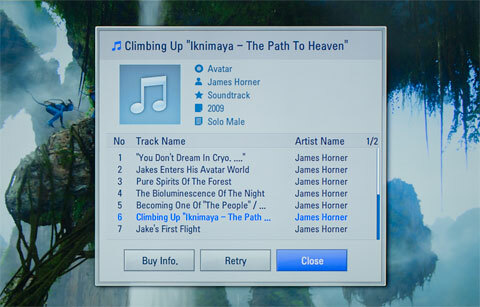 Profile 1.1, (also called BonusView), players added the capability for displaying Picture-in-Picture (PIP) and playing secondary audio tracks available on BonusView discs. 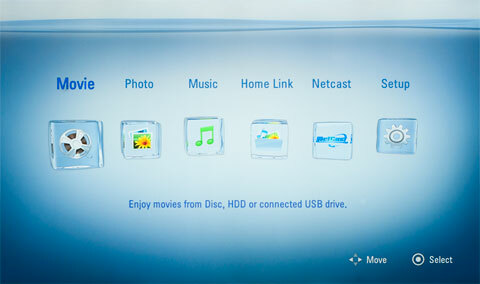 After October 31, 2007, all new Blu-ray players had to offer all the features in Profile 1.1. BD-Live (Profile 2.0) players must have an Ethernet port for connecting to the Internet, where it can download online content associated with BD-Live Blu-ray titles. The matte black player sports a brushed metallic stripe on the top of the front. The face has a shiny black plastic flip down door that reveals control buttons on the right. Underneath them is the USB port where you can insert a flash drive full of photos, songs or video clips and play them back through your TV. You can also download BD-Live content onto a flash drive, though with the built-in storage, I don't see any reason why, unless you discover that you are running out of space on the internal drive. Then you can attach an external USB hard drive to the connection and the player can read and write files to it. On the back of the machine, the connection panel supplies one HDMI out, one set of Component Video (YPbPr) outs (with a matching pair of stereo audio outs) and a Composite out. The BD590 does not furnish 7.1 channel analog audio outputs, but it does provide two forms of digital audio outputs, optical and coaxial. Or you can simply run digital audio through the HDMI cable along with the video. Either way, the BD590 supports internal decoding of up to 7.1 channels of bitstream output of enhanced audio codecs like Dolby TrueHD and dts-HD Master Audio. LG has integrated a wireless LAN adapter into the BD590, which is 802.11b/g/n (2.4GHz band only) compatible. They also provide a LAN port on the back for those who prefer a wired network solution like I do. I appreciate that running Ethernet wires from routers to players can be loathsome, but with the current state of the wireless art, I still feel more comfortable with a wired solution. As the BD590 manual states, "Wired internet connection is strongly recommended. Using the [Home Link] features, network update and video streaming services (such as, Netflix, Vudu, CinemaNow and YouTube Videos) with wireless network can be affected by the household devices using radio frequencies." Wired or wireless, if you plan on streaming video and you are serious about obtaining good picture quality, you will need fairly fast and robust bandwidth from your Internet service provider, ideally around 10Mbps. 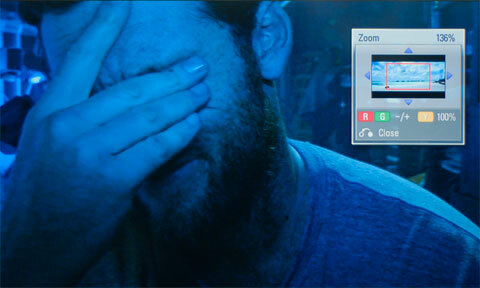 For example, Vudu streams movies in three different video qualities. These are their bandwidth recommendations: SD (480p) 1Mbps to 2.25Mbps, HD (720p) 2.25Mbps to 4.5Mbps, and HDX (1080p) 4.5Mbps to 9Mbps. In addition, if you decide to go wireless, buy the fastest router that you can afford. At this time, that means 802.11n. Its no fun waiting for a streaming movie to buffer because your downloading is hobbled by a slow router. Once you set up your network connection, (which I'll discuss later), you can access LG's content providers by clicking on the Netcast icon on the Home menu. 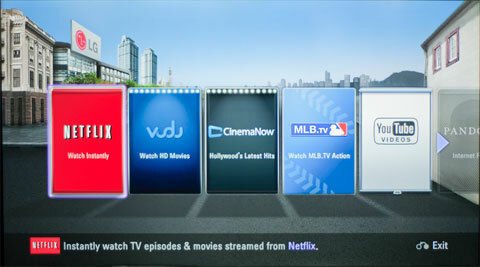 LG has partnered with the usual suspects, Netflix, Vudu, CinemaNow, YouTube, Pandora, Picasa, Napster, AccuWeather, and MLB (Major League Baseball), which should keep you thoroughly entertained and informed. You cannot access Facebook or Twitter through Netcast. But by selecting Home Link on the main menu, you can tap into your home network and access content from your computer and play music, videos and photos back on your TV without having to transfer the files to a USB flash drive. This feature will search any connected DLNA media device for content to playback. The slideshow interface for playing photos is fairly basic with only three slide durations (Fast, Normal and Slow). It does provide three transitions, Wipe, Door Slats, and Lattice, with a few options. You can also add music to your slideshows. Now, about that built-in hard drive, my initial notion was for storage of media that you already own, like photos and music. Just imagine, you could download your family photos and videos onto the BD590, pack it up and take it over to grandma's house, plug it in to her TV and share the memories. Or you could download a film from Vudu and take the player over to your BFF's apartment for a quiet movie night. The process to transfer files directly from your PC to the Blu-ray player's hard drive is not difficult, but it's not drag and drop. I had to read the manual to guide me through it. Even then, I was a little too anxious to punch a button and I surprisingly started to download all of my 1400 songs from my PC. Another method of adding music to the hard drive is through the BD590's archiving facility. If you have a CD collection, you can pop a disc into this Blu-ray player and LG supplies the software to archive it directly onto the hard drive. 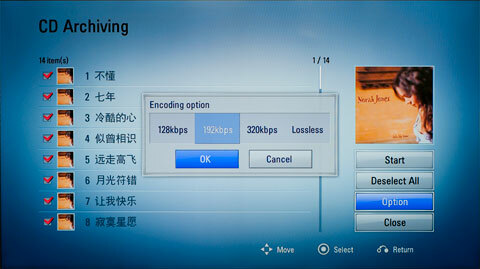 You can even choose the bit rate for encoding. The software will also generate the song list and the album cover. Though as you can see for this Norah Jones album, the song titles are displayed in Chinese and it's the wrong album cover. In the manual, LG estimates that the 250GB hard drive will hold up to 88,000 MP3 songs or 35 HD movies or 160 SD movies. When playing a Blu-ray or DVD on the BD590, LG offers a few more fun features. For example, if a song is playing in the movie, you can punch the Music ID button on the remote control. If the player is connected to the Internet, it accesses Gracenote and displays the song highlighted in the soundtrack list. If you hit the Zoom button, you can zoom and move around the picture. And the Info/Display will to bring up the Picture Mode menu, which is filled with interesting data. For example, the Movie Information button will list the cast and give you a synopsis. The glossy black remote control is not backlit, but the buttons are big and the white stenciled labels are easy enough to read. The manual is well-written and does a good job of clearly explaining the different functions of the player. It is also sprinkled with tidbits like a table that shows the average time it takes the BD590 to archive a four minute audio track at 192kbps, (15 seconds). The EPA has also begun a list of ENERGY STAR qualified Audio/Video equipment, including devices like Blu-ray players. (You can find it here.) The LG BD590 is on the list. The EPA list only shows Watts in Standby. For this LG, the list states .1W. We decided to take our own measurements at different stages. To measure power, we hooked the BD590 up to our watt meter, called Watts up? Pro, and took a reading during different operations. During playback of a Blu-ray DVD, the meter ranged between 22.5 and 24W. If I stopped playing but still had the disc in, the Home menu pops up and the meter hovers around 17W. When I streamed the HD version of a movie from Netflix, the reading rose to about 17.5. When I played a song that was stored on the hard drive, the meter fluctuated between 16.8 and to 17.5W. I have tested other Blu-ray players that used less energy when spinning a Blu-ray disc. Though 24W isn't a lot, I consider this LG BD590 to be on the high end of the spectrum. The real power waste happens if you don't turn off the player when you are not using it. To assist you, LG provides an Auto Power Off setting that you can find in the Setup menu. It will turn the player off approximately 30 minutes after you put it in Stop mode. The first time you plug in the BD590, you will need to go into the Setup menu and adjust a few items according to your configuration. In the Display sub-menu, check that the resolution and aspect ratio match your TV. Again, the manual does a good job of explaining the options. In the Audio sub-menu, you can dial in the output formats. Perhaps the scariest for some people is the Network menu. I found it straightforward. 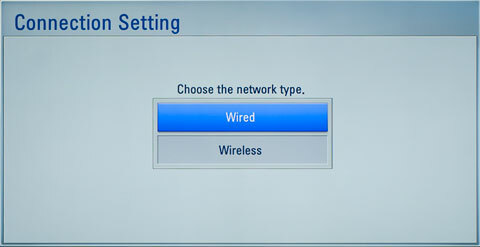 If you have plugged an Ethernet cable from your router to the BD590, select that option and the player should automatically find your network and connect to it. 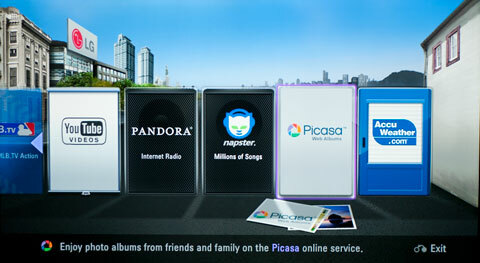 If you have opted for wireless, then the player searches for any and all available wireless networks. You pick yours from the list and enter your password, if that's your security setup. I tried both methods and both worked well. Once the player is linked to the Internet, the first thing to do is to check to see if your player has a firmware update. The player will go online to see if you have the current firmware version and if not, it will download and automatically install the new one. If you decide not to connect the player to the Internet, you can download any updates from the LG website onto your PC and then to a USB drive. Next, if you plan to take advantage of any of the streaming features, you need to sign in and or register your Blu-ray player. For example, to watch Netflix movies, you will need to pay a monthly subscription to Netflix and register your player on their site. Other services like Vudu are pay as you go, but you still must open an account online. Finally, in the Picture Mode menu that I discussed previously, you can pick from four different modes, Vivid, Standard, Movie and User. If you pick User, you can tweak Contrast, Brightness, Color and Sharpness. I wouldn't futz with those because I believe that any major tuning should be handled at the TV. But you do need to pick one of these modes. I suggest choosing Movie - definitely not Vivid - and walk away. When playing Blu-ray discs, the LG BD590 performed like a champ. I tried a couple of SD DVDs and the results reconfirmed my past experiences with other Blu-ray players. Upconversion of standard definition DVDs can only perform so much magic. If the DVD itself is well mastered, then it will look very good upconverted. If the master is muddy, then upconverting it is like holding a magnifying glass up to the zits on a pimply teenagers face. Of course, the other limiting factor to picture quality is how good your HDTV or projector is. The same axiom applies to audio performance, ultimately quality will be determined by your sound system. I believe this is especially true with the digital Dolby TrueHD and dts-HD Master Audio signal coming through the HDMI cable. The major factor will be the quality of your A/V receiver and speakers. If you are simply feeding the audio straight to the usually woeful speakers in your TV, then the sterling quality of the audio emanating from the Blu-ray player is overkill. As for the performance of the audio archiving feature, I didn't cross compare the sonic qualities of the different encoding bit rates. I think that is a private affair between an audiophile and his headphones. I consider that the LG BD590's MSRP is a good indication of its feature set, built-in Wi-Fi with a pile of Internet content apps plus a bonus 250GB hard drive. But in this marketplace, $349 is steep, even for those goodies. Then again, a quick tour of Internet retailers reveals that the street price is often $125 less than retail. At that cost, the BD590 becomes more compelling, especially if the internal hard drive catches your fancy. The LG BD590 adds an internal 250GB hard drive to the usual assortment of high-end features like built-in Wi-Fi connectivity and a host of Internet content apps. The package makes this Blu-ray player a very capable stand-alone media server, indeed.